One-man company Word to Info on Friday expanded a string of patent lawsuits over natural language processing technology — active cases involve Amazon, Google, Microsoft and Nuance — to include Apple, taking specific aim at the tech titan's Siri virtual assistant. Filed in the patent holder-friendly Eastern Texas District Court, Word to Info's suit alleges infringement of seven patents detailing methods of natural language processing. The company asserted the same series of patents against a number of tech industry giants marketing their own voice recognition and virtual assistant solutions. Specifically, Word to Info is leveraging U.S. Patent Nos. 5,715,468, 6,138,087, 6,609,091, 7,349,840, 7,873,509, 8,326,603 and 8,688,436 in its case against Apple. The IP string covering methods of interpreting natural language input dates back to 1998, when the U.S. Patent and Trademark Office granted the '468 property to inventor and Word to Info director Robert Budzinski. Word to Info claims Apple has knowledge of at least one of the patents-in-suit, which was cited "at least 65 times" in various Apple IP. Such listings include U.S. Patent Nos. 8,713,119, 8,903,716 and 9,548,050, each relating to personalized virtual assistants with contextual language processing capabilities. For example, the '050 patent describes techniques of creating a virtual assistant that can engage with a user in an "integrated, conversational manner using natural language dialog." Prior knowledge of the patent or patents could prove willful infringement on Apple's part. Apple debuted Siri alongside iPhone 4S in 2011. 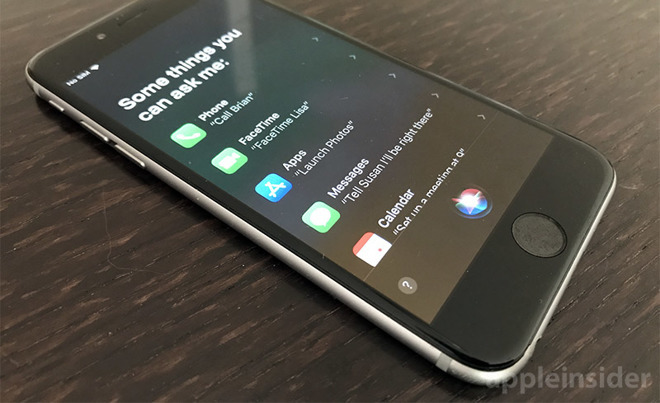 Initially based on Nuance voice recognition and natural language processing technology, Siri in its most recent iterations is powered by Apple's in-house engines. Less rigid than legacy rulesets, the latest software relies on cutting-edge artificial intelligence and deep neural networks developed by Apple engineers, some of whom were poached from Nuance. Budzinski and Word to Info has been on the hunt over the past few months, using the same batch of patents in separate cases targeting Amazon's Alexa, Google's Knowledge Graph, Microsoft's Cortana and Nuance's LinkBase software. Nuance was the first to see action in a complaint filed against the company's software and services in January. Very little is known about Word to Info, though it seems the firm is a non-practicing entity solely reliant on Budzinski's owned properties. A number of business tracking websites list the Texas entity as a personal services company founded in 2013 under the "Photographer, Still or Video" category. Tax documents show Word to Info operates at an address that appears to be Budzinski's house. Complaints lodged in each of the active cases do not mention whether Word to Info attempted to license its patented technology to the defendants prior to litigation. The suit arrives just one month before Apple is expected to release iOS 11 with enhanced Siri functionality. In the next-generation operating system, Apple's virtual assistant benefits from a revamped backend that boasts more natural sounding responses and hooks into advanced features like language translations. Word to Info seeks unspecified damages and reimbursement of attorney fees in its case against Apple.